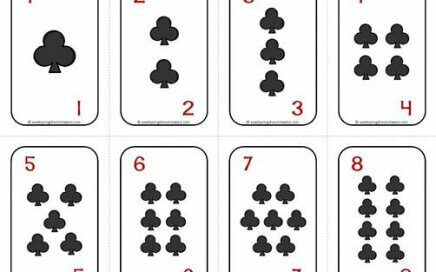 Your kids will want to get in on all the math card games they can play with these number cards 1-20. They’re fashioned after traditional playing cards. Sized about a half inch taller and wider than a deck of cards, these are a great size for little hands to hold onto. These cards come in full decks and smaller sets by suit only. The all come in two forms. First, the suits are in the centers of the cards with the numbers in the corners, and the other is the opposite, with the numbers in the center and the suits in the corners. 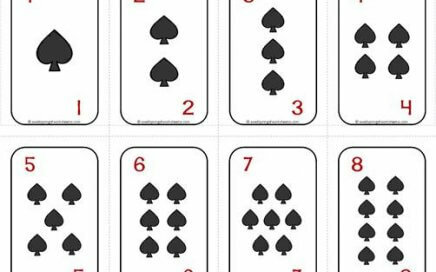 There are many ways these can be used – for math card games, counting, sequencing, comparing numbers, and so on. It is recommended that these cards be printed on card stock and laminated. Choose one of the the included backing designs below for the backs of the cards. If interested, go to this page to choose from even more kindergarten number worksheets. Here’s a cool set of playing cards for number and counting practice! They’re just like a deck of cards, but without the jack, queen and king, etc. The numbers 1-20 are in the center of the cards with the suits in the corners. Now this is a great set of numbers cards 1-20. Just like a regular deck of playing cards, they have the suits in the center of the cards and the numbers in the top left and bottom right corners. Want to have a neat design on the back of the cards on this page? Simply copy this vertical design of the suits onto the back of the cards before cutting them apart. 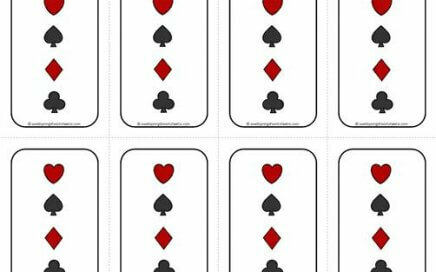 In a simple and classy fashion, this set of playing card backs has images of the four suits in a square pattern in the middle of the cards. Print your cards, copy this onto the backs, cut apart and you’re ready for some fun. A fine set of playing cards that has only the clubs. 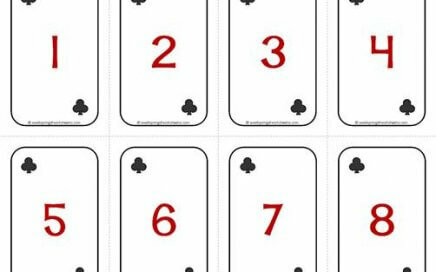 The numbers 1-20 are in the centers of the cards with the clubs in the outer corners. This set of cards has only the diamonds. 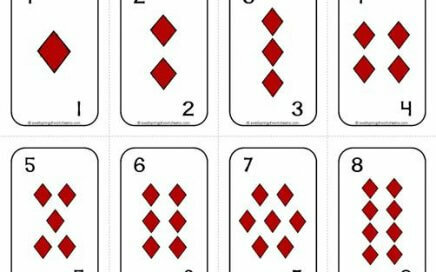 The numbers 1-20 appear front and center in the middle of the cards with the diamonds in the top left and bottom right corners. 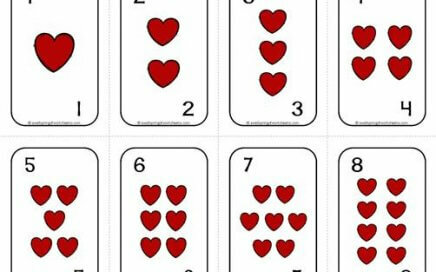 These cards include only hearts. The numbers are in the center of the cards with the heart motifs in the top left and bottom right corners, the opposite of traditional playing cards. 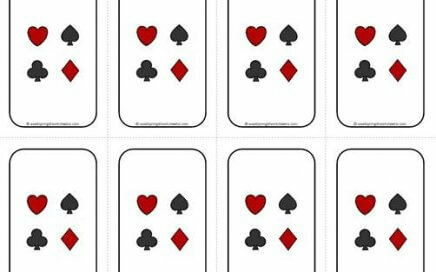 In this set of cards the numbers 1-20 are in the center and the spades only are on the top left and bottom right corners. Just like traditional playing cards, these cards have the clubs in the center of the cards and the numbers in the top left and bottom right hand corners. Diamonds are a girl’s best friend and these can be your new best friend in playing cards. They have the diamonds in the center of the cards and the numbers in the corners. Did I hear you say spades? Comin’ right up! This set included exclusively the spades in the center of each card and the numbers 1-20 on the outside corners.